Although many health professionals state that alcohol use during pregnancy is detrimental for your growing baby, you may have heard mixed opinions about the safety of having a drink each day, particularly during the third trimester, when it seems that much of your baby's body has already been formed. Drinking alcohol during pregnancy, even wine in the third trimester, can still put your baby at risk. Because of the range of severity associated with FASDs, it is difficult to say exactly how much alcohol use will result in a baby developing these symptoms. Stopping at one glass of wine each day does not necessarily prevent an FASD from developing. Additionally, children with FAS may have smaller brain sizes overall when compared with children of mothers who did not drink alcohol during pregnancy. Fetal alcohol syndrome causes neurological problems because the alcohol makes the brain cells more vulnerable to damage from free radicals. These substances attack and can destroy brain cells while a baby is developing. This is important, not just during the first trimester when a significant portion of the brain is growing, but throughout pregnancy. The third trimester can be a period of growth that is acutely susceptible to damage from free radicals associated with alcohol. Light to moderate drinking is considered to be one drink per day or less of alcohol. This amount of alcohol consumption may or may not have an effect on your baby's weight when she is born. A 2010 study in the International Journal of Epidemiology showed that light to moderate alcohol consumption did not affect the growth of a baby before birth, nor did it cause a low birth weight. Future studies are needed, though, to determine if drinking a glass of wine daily during the third trimester of pregnancy has any effect on a child's growth rate after birth. It may seem that drinking a glass of wine during pregnancy is safer than drinking beer or other forms of liquor. Wine is sometimes promoted as being healthy for the heart, and a glass of wine often appears more relaxing as opposed to beer or "hard" liquor. The truth is that alcohol is the same, whether it is in the form of wine, beer, or distilled spirits. While the amounts may differ in terms of alcohol content, for instance, a 5-oz. glass of wine has approximately the same amount of alcohol content as a 12-oz. bottle of beer; the effects of alcohol are the same within the body. 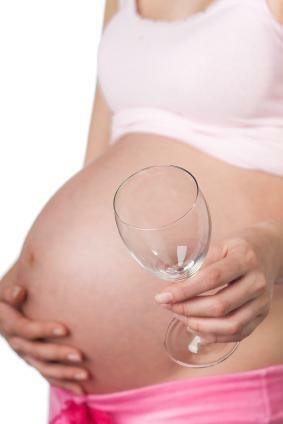 Some women may believe that wine is safer to drink than beer or hard liquor while pregnant. They may also reason that the third trimester is a safe period and alcohol is only damaging during the early months of development. The Centers for Disease Control and Prevention state that no amount of alcohol during pregnancy is safe and recommends that all women abstain from drinking alcohol throughout pregnancy. It can be confusing to try to understand which activities are forbidden during pregnancy and which ones are allowed. Some women state that they have been told that an occasional glass of wine during the third trimester is allowed. The results are often mixed and it can be hard to keep up. Talk with your doctor about the impact of alcohol use during your third trimester to ensure the healthiest practices for both you and your baby.